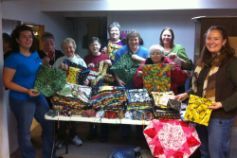 The Community Sewing Committee holds workshops approximately 9 times a year. The information about the workshop and location will be presented at the guild meeting and in the newsletter. Members provide labor and machines, and the guild provides materials. Any amount of time you can contribute is appreciated. You can come iron, cut or sew. Quilts that are made, are donated to the Red Cross (fire victims) and Stevie’s Place. We very graciously thank those of you who have volunteered your time and talents to quilting. We don’t expect you to donate your time and talents. I have posted the pricing guidelines below. This is a great way to practice, if you and your long arm machine are just getting acquainted. Copyright ©2008 Cabin Fever Quilters Guild. All rights reserved.